Strategies that depend on short option time decay to make money, typically when stock or ETF price is *flat* or moves slightly *down*. Market rallied significantly on Fed announcement of “patience” on Wed Dec 17. Position expired OTM, losing about $290. Limited risk reward trade, executed in IRA. Lesson learned “I fought the FED and the FED won”. Decided to lightly short home builders, has not made a new high with the market and has run up significantly in the last 2 weeks, and maybe at longer term down trendline. We have been running long SPY butterflies for the last 6 months, and on average have lost a small amount of money so far. Mostly because of a continuously rising market for the last 5 months with little downside volatility. THe advantage of a long butterfly placed for a small debit is that typically only that small debit is lost if we are “wrong” on direction. Sale PUT SPY 160 Jun 2013 SPY1322R160 contracts -10 2.42   2,405.50	  - short "head"
Purchase PUT SPY 157 Jun 2013 SPY1322R157 contracts  10 1.54  (1,554.45)  - long "wings"
Purchase PUT SPY 157 Jun 2013 SPY1322R157 contracts  10	1.54  (1,554.45)  - long "wings"
Sale PUT SPY 153 Jun 2013 SPY1322R153 contracts -10	0.85     835.53	  - short "tail"
This is a much safer way to sell premium than a traditional put credit spread. 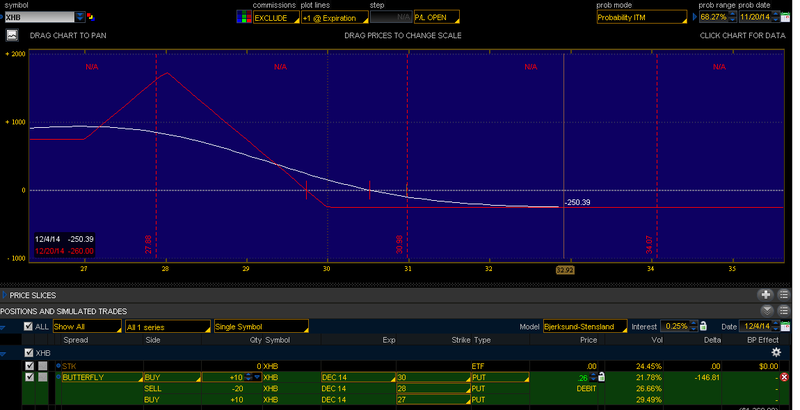 The options tend to move all together in the first few days of the trade, showing little p&l for the overall position. However after about 10 to 30 days in a butterfly position the “tail” (lowest option leg) of the butterfly should start to decay faster than the “head” and the “wings” together (the top three option legs). The “head” and “wings” option legs typically follow each other relatively closely until about 10 days out from expiration. With about 10 days to go to expiration, the direction of the underlying starts to make a much bigger difference to the overall position p&l. Note: if the market crashes more than about 10% this position will still actually make a small profit. So want the position to go up or remain flat, or crash very hard and very quickly. A slow drift downwards would likely be bad for position over next 45 days to expiration. This short put butterfly is also a long volatility position – that should make money if volatility picks up, so it is good for this very low volatility environment. Long butterflies (the opposite trade to this one) are great trades when volatility is higher, but they don’t always make sense when vol is this low (unless you are using them to hedge a stock position). With silver (SLV) massive selloff the volatility is sky high, which gives us the opportunity to do long butterfly for May 2013 expiration. Purchase PUT SLV 22 May 2013 SLV1318Q22.5 contracts 6   1.27  (773.45) - long "head"
Sale PUT SLV 21 May 2013 SLV1318Q21   contracts -6  0.71  414.54   - short "wings"
Purchase PUT SLV 19 May 2013 SLV1318Q19   contracts 6   0.33  (209.45) - long "tail"
Investment thesis is that it sells off about 5% from here or stabilizes, while the volatility collapses. We would only lose a small amount in either direction (up or down) if we are wrong, and have the opportunity to make money if SLV stays in the range of 23 to 20.5 near to May expiration. The advantage of a long butterfly placed for a small debit is that typically only that small debit is lost if we are “wrong” on direction.